According to the Canadian Mental Health Association, 1 in 5 Canadians will experience a mental health issue in any given year and by the age of 40, there is a 50% chance you will either have or have had a mental illness. Anxiety affects about 5% of Canadians with at least 8% of us experiencing major depression at some point in our lives with suicide representing a leading cause of death in Canadians aged 15-44. Mental Health is no joke. Today’s article, purposefully published on Bell’s national #LetsTalk day, will not only introduce you to a more personal side of me, but will also explore nutrition’s role in the prevention and management of mental illness. Let’s Talk Day is a nearly decade old tradition in Canada that is all about encouraging conversation on the topic of mental heath for the primary purpose of increasing awareness and decreasing stigma. Millions of Canadians take part in this initiative, and today I am one of them. Today, in celebration of Let’s Talk Day 2019, I am choosing honour my dearly departed friend Josh with an exploration of the evidence connecting nutrition mental health. Josh, who I’d known since we were both kids, lost his battle with mental illness in February 15′. At the time of his passing he was pursuing a Masters of Science and specifically examining the effect of antioxidant supplementation for symptom management in those taking anti-psychotic medications. Although I rarely discuss such intense personal matters, sharing his story and keeping his memory alive are important to me and today’s article serves as a small tribute to him, while also hopefully opening up the discussion on the connection between nutrition and mental illness. I don’t think it should particularly surprise anyone to hear that those with higher intakes of fruits, veggies, whole grains and fish tend to have a lower depression risk than those with lower intakes of these foods. Case in point, those who strongly follow a Mediterranean diet pattern were better protected against depression than those who just follow it moderately, especially with advancing age. Another observational study linked anti-inflammatory diets with a reduced depression risk. Although it isn’t necessarily the best descriptor of a dietary pattern, take a look at one of my previous articles here to get a better understanding of the foods that may be considered anti or pro-inflammatory. Generally nutrient-poor diets are also associated with differences in physical features of the brain. An imaging study found that those with poorer diets tended to have less left hippocampus tissue. For those that may not know, the hippocampus is associated mostly with memory. The association between nutrition and mental health is not exclusive to adults either. In one study, diets that the authors identified as “good-quality” were associated with better mental health in children and adolescents. But what is a good quality diet? An observational depression risk study out of China found that dietary patterns rich in red or processed meat, refined grains, high fat dairy products and paired with low fruit and vegetable intake, were associated with an increased depression risk. In fact, “lower quality” diets consumed during pregnancy were found to be associated with a higher risk of a child dealing with either externalizing or internalizing disorders ( a type of behavioural issue). Although I’ve presented observational rather than causal data in this first section, we can still see right off the bat that there is an intriguing link that exists between overall dietary patterns and depression risk in particular. What happens when you take people living with, or at risk of, mental illnesses ( such as depression) and use healthier eating as an intervention to improve outcomes? Well, A 2013 trial out of the BMC journal found that a Mediterranean diet supplemented with tree nuts reduced the likelihood that men and women with type 2 diabetes would be diagnosed with depression. In 2017, a BMC journal paper shared the results of a noteworthy randomized controlled trial known as the “SMILES” trial. Intervention: 12 week period. Dietary intervention ( 7 visits with a dietitian) vs Control ( 7 visits with a social support group). Results: Dietary intervention proved significantly superior in improving outcome of interest. Conclusion: Dietary intervention with the assistance of a dietitian has the potential to help reduce symptoms in those already diagnosed with moderate to severe depression. So far I’ve looked mostly at the evidence of overall dietary patterns and dietary improvement, but I do know that everyone loves to hear about the specific nutrients or foods they should look out for when it comes to any given condition. That’s exactly what I plan to look at next. A 2018 systematic review and meta-analysis out of JAMA found that, in certain clinical contexts, omega-3 supplementation of at least 2000 mg/day reduced symptoms of anxiety in those who suffer from clinical anxiety. For reference sake, 2000 mg of omega-3 fatty acids would roughly be the equivalent to what would be found in 1 tbsp of flax or chia seeds, or 150 grams of salmon*. *It is important to acknowledge that plant and animal-based omega 3 sources contain different varieties of this essential fatty acid, which may alter their efficacy. In those who are omnivores, regularly incorporating both plant and animal-based omega 3 sources appears a reasonable and advisable course of action. As some limited evidence exists relating to vitamin D intake and depression symptoms, fish intake for omnivores remains important due to its high vitamin D content. In a 2018 Frontiers In Psychology paper, authors noted that patients with higher markers of inflammation ( such as IL-1 or C-reactive protein) enjoyed greater benefit from omega-3 supplementation. This is an intriguing finding and perhaps unsurprising given how well recognized omega-3 fatty acids are associated for their anti-inflammatory capabilities. Given the increasing attention paid to the gut-brain axis and the emphasis placed on better understanding on how gut health may affect brain health ( and vice versa) I knew that probiotic supplementation would be an area of interest for today’s article. After a reviewing a number of recent papers, my best conclusion is that the results are mixed and inconclusive. Although a potentially promising option for future exploration, there is not enough evidence to suggest probiotic supplementation is a proven and efficacious means to address the symptoms of anxiety and depression. Remember as well that probiotics are available to us via foods such as yogurt, kefir, tempeh, kimchi, kombucha and that the health of your gut flora is supported by a strong, balanced and healthy diet. I’ve certainly noticed the evidence surrounding B vitamins and mental health so when I encountered an observational study from 2006 suggesting that folate may be protective against depression in men, while B12 may be protective against it in women, I knew I had to make note of it. Top sources of folate include: legumes, leafy greens, citrus, broccoli and Brussels sprouts. I include this list not because the study is particularly profound but because most guys out there can definitely use a little push to eat more of these healthful foods. Top sources of B12 include: meat, eggs, dairy, fish and plant-based sources such as fortified soy milk and nutritional yeast. For any woman reading this who may be vegan/vegetarian or otherwise have a minimal intake of animal products, it is important to be aware of plant-based B12 alternatives. Much of what I’ve shared here today revolves around the simple fact that it seems that “healthy eating” offers some protection against negative mental health outcomes. Generally speaking, when you eat well, you get plenty of antioxidants. For that reason, it comes as no surprise that this 2016 AJCN paper found that flavonoids ( a family of phytochemicals with antioxidant capabilities) may be protective against depression in older women. 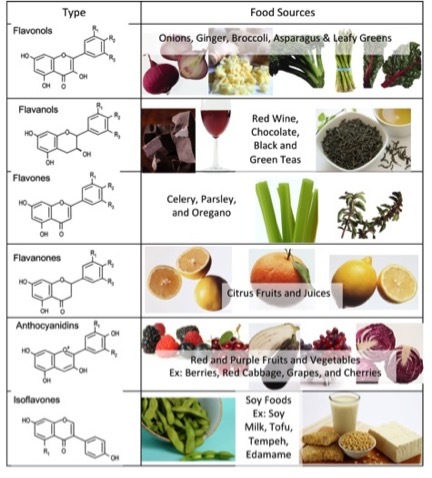 Provided here is a useful, if not aesthetic, chart that outlines some of the richest sources of dietary flavonoids. There is some limited evidence examining the role that zinc and magnesium play in modulating depression risk and symptoms. Magnesium in particular is a nutrient of interest for the simple reason it tends to be under-consumed in Canada. I am including this sub-heading with minimal context as a great opportunity to remind everyone to eat more nuts, seeds and legumes. These are healthy foods that we don’t get enough of, that contain plenty of zinc and magnesium, and are included in great supply in the healthy dietary patterns ( such as the Mediterranean diet) that tend to be associated with a lower depression risk. Hope you enjoyed my not-so-shameless plug for nuts, seeds and legumes ( lentils, chickpeas, soy). I won’t be discussing herbal supplements at length as I’ve already surpassed my self-imposed 1500 word limit, but for those interested please feel free to take a look at this systematic review from 2010 which takes a closer look at the potential efficacy of herbal supplements for anxiety. Today’s blog is wholly dedicated to my dear and departed friend Josh. It is obviously just a small taste of this vast field of study, but hopefully it provided valuable insights none the less.